A 286-foot 14-year-old luxury liner will be entering the Great Lakes this summer under the name Saint Laurent. The vessel’s new owners say the ship has been entirely rebuilt and prepared for an introductory voyage in July from Montreal to Chicago, hitting all of the five Great Lakes. Launched as the Clipper Voyager in Florida in 2001, the small luxury liner was especially designed for small coastal and river voyages. It has changed ownership and names, with its last name, Sea Voyager, with Nassau, Bahamas its last port of registry. The ship was purchased by the Haimark Line, with offices in Denver, Chicago and Berlin, completely refurbished and prepared for operations on the Great Lakes beginning this summer. The last luxury vessel of its kind to operate on the Great Lakes was the Aquarama, a 520-foot-long ship with capacity for up to 2,500 passengers. That ship ran from 1962 to 1983 on a Detroit to Cleveland route. The Saint Laurent is smaller, with accommodations for 210 passengers. Its owners say the vessel is especially designed to enter shallow-water ports and bring its guests on sight-seeing tours not available on vessels of its size for nearly a century. FleetPro will be offering the technical and hotel accommodations for the ship which offers 105 rooms on four decks, and facilities for sunbathing, a full-service boutique and salon. The vessel has a spacious dining room and lounge. Many of the amusements offered by big ocean-going luxury liners, including live entertainment and public events are included in the package. 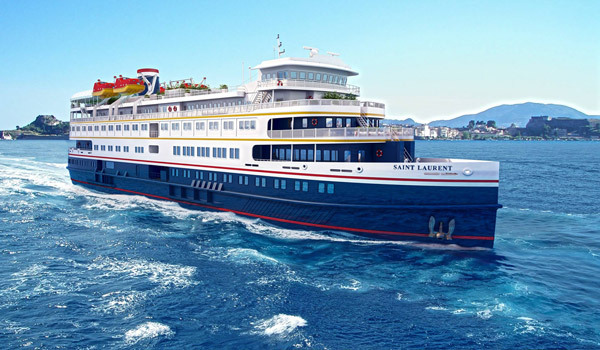 The special "maiden voyage" for the Saint Laurent will begin at Montreal, Canada, travel up the St. Lawrence Seaway to Lake Ontario, then move through the historic Welland Canal. Passengers will visit Niagara Falls before sailing on through Lake Erie, up the Detroit and St. Clair Rivers to Lake Huron, with stops in Windsor and Detroit. After entering Lake Huron the ship will visit Manitoulin Island on Georgian Bay, go on to Sault Saint Marie and Mackinac Island. The final leg of the trip will be the full length of Lake Michigan with a final stop at Chicago. For more information or to book a passage go to www.greatlakescruising.com/saint-laurent.